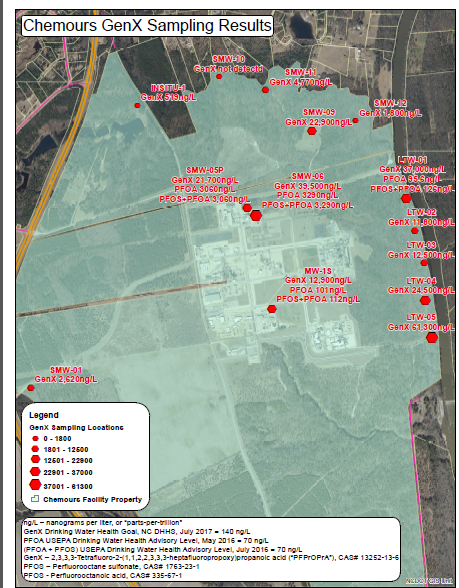 The North Carolina Department of Health and Human Services, the Centers for Disease Control and Prevention, and the Bladen and Cumberland county health departments plan to test the blood and urine of up to 30 residents living near Chemours’ Fayetteville Works facility for the presence of GenX and 16 other per- and polyfluoroalkyl substances, also known as PFAS. Health officials will begin calling selected residents near the Fayetteville Works facility this week to invite them to participate, and residents with private wells that had the highest detections of GenX during the sampling will be contacted first. At least 225 private drinking water wells in neighborhoods near the plant have tested above the state’s provisional health goal of 140 parts per trillion for GenX. Other fluorinated compounds previously have been discharged and emitted from the Chemours plant, and are present in the environment. The purpose of the testing is to determine if PFAS can be detected in blood or urine from area residents, and if so, how their levels compare to levels detected from other parts of the country. Human health effects associated with PFAS exposure are not well understood, although there is some indication they may be linked to thyroid disease, high cholesterol and some cancers. Participation is limited to no more than 30 people based on CDC testing capacity. Each household will be limited to one adult participant and one child participant (12-17 years old). Individual results will be shared with participants, and summary results will be shared with the public without participants’ private information. Urine samples will be tested for GenX and seven other PFAS. Blood samples will be tested for nine PFAS, and may be tested for GenX if it is detected in urine samples. Another similar study is being conducted by NC State University’s Center for Human Health and the Environment; that group of scientists is studying the blood and urine of nearly 200 people in New Hanover County, where GenX was initially detected in the drinking water.